Future Customer Experience - what will this look like in 2020? Today’s world of “always on”, 24 hours a day communication, poses multiple challenges for organisations trying to keep abreast of customer expectation. So what will the customer experience in 2020 look like? 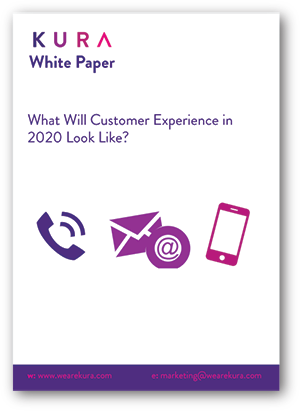 This paper sets out Kura’s vision of the contact centre in 2020 - what is the future customer experience? A vision based on our experience of the past and understanding of the present, from a contact centre outsourcer’s perspective. Complete this form, to download your copy of this report.